Growing up in an SBC church in a small, rural West TN town, I had never observed Lent. I can remember being so confused on why my friend Carmen (who attended a Methodist church) would EVER think it was a good idea to give up Coca Cola for 6 weeks?? Throughout college, I learned more about Lent and why it’s important but still to this day, I’ve never fully observed it; I’ve started the season fasting from something insignificant and still failed. This will be my first year to not only fast from something I think is important in my faith journey but I’m also committing to the She Reads Truth study, “Jesus, Keep Me Near The Cross” which is a study specifically for the Lent season. I came to this place of choosing how I would fast during this season over a series of conversations with the Lord over the past couple of months. See, I’m not real good at taking care of myself. I’ve struggled with making healthy life choices for as far back as I can remember. I wasn’t an athlete in high school so the whole active lifestyle is truly a challenge for me. I grew up in a family culture where you sat down at Maw’s table and talked and ate your way through anything that was bothering you – or you made a road trip to Sonic for Happy Hour drinks! Over the past few years, I have made really great strides in changing unhealthy habits. Even in 2014, I lost 35 lbs. and had developed a nice workout routine but as I entered this new season of life in marriage, I’m struggling to get back on the horse. Luckily, I’ve maintained that weight loss for the most part but it’s just finding that groove again. My husband doesn’t have as much of a struggle. He has a group of guys that he meets at the gym for basketball multiple times a week and his family culture has reared him toward healthier eating choices. WOW! That’s exactly right. If Jesus is not my absolute Lord of all areas of my life than he’s not Lord at all. One of my biggest pet peeves in life is when believers want to pick and choose what scriptures from the bible they want to live by. They want his grace and mercy but don’t want the sacrifice and obedience. Hello? Let’s talk about my hypocrisy for just a minute! Trusting Jesus to provide me a new position at work and seeing him provide that in his perfect timing wasn’t enough? Trusting Jesus to heal my broken heart and spirit after losing my parents and seeing his healing hand at work each and every day hasn’t been enough? My problem isn’t my circumstance… it’s my faith! It’s my faith in Jesus that he can take my greatest weaknesses and prove His strength and might! That though I am weak, HE is strong! Today in my reading, I was really taken back with the thought of the scripture in Genesis right after the fall when God is speaking to Adam and Eve about the consequences of their actions for not only themselves but all mankind. 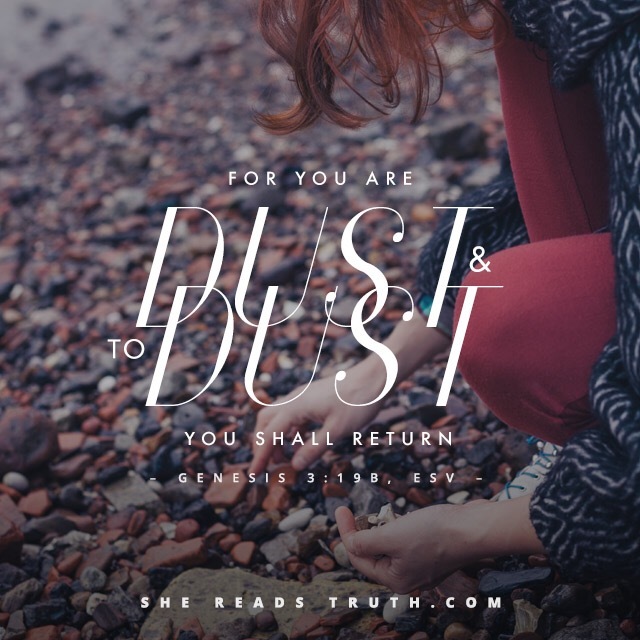 In Chapter 3: Verse 19 we read, “For you are dust, and to dust you shall return.” That really got me thinking this morning about how we only have what comes from dust to dust. We only have this one life and haven’t a clue as to when it will end. We must take advantage of the time that we have and make sure that our one life counts – and for me, I want to make sure that my one life counts for Jesus! There will be no time for apologies or excuses once our time is up! We have to get it right here and now! My struggle with health and fitness has nothing to do with how my body looks but all in how I can best serve Jesus with it! Just like I’m only given one life, I’m also only given one body and I must make great strides in honoring my body and taking my health seriously so that when my time on this earth is finished, I can honestly say that I truly gave my all and that I truly lived.